In a surprise reveal during the launch of the 2018 Yamaha MT-09, the covers were thrown off the 2018 Yamaha X-Max 250 scooter, which will enter the Malaysian market at the end of March. 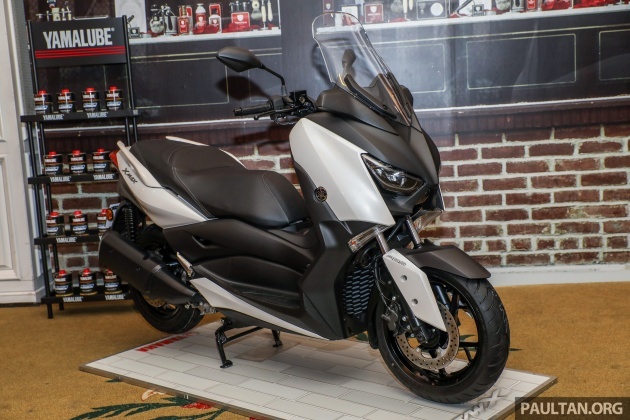 Manufactured in Indonesia and coming in as a CKD unit, the X-Max 250 scooter does not have any official pricing as yet, pending approval from the authorities. Carrying a single-cylinder, liquid-cooled 249 cc power plant, the Yamaha claims the X-Max 250 puts out 20.12 hp at 7,500 rpm and 21 Nm of torque at 6,000 rpm. The engine follows Yamaha’s Blue Core design specifications for efficiency and is fed by EFI and transmission is a conventional automatic gearbox with V-belt drive. Starting is electric and fuel is carried in a 13.2 litre tank, while storage space for two full-face helmets can be found under the seat. While the full specifications of the Malaysia market X-Max have not been revealed, the European X-Max comes standard with ABS and traction control, along with keyless start. Inside the X-Max 250’s dashboard cubby is a 12-volt outlet that can be used for charging electronics and twin analogue clocks with an LCD panel for other necessary information. LED lighting is found throughout the X-Max 250, including LED position lights. Rolling on a 15-inch wheel in front and a 14-incher at the back, the X-Max is braked with a single 267 mm diameter disc in front, and a 245 mm unit in the rear. No word on colour choices as yet, but the two 2018 Yamaha X-Max 250s shown during the reveal were dressed in white and burgundy. My guess it’ll be about RM22k. Why no new r15 or mslaz yet?? If priced right, this will be a best seller here. Finally a great bike …. what a pleasant surprise from yamaha! Everything now made in Indonesia or Thailand. Nobody wants to manufacture in Malaysia anymore. I don’t know why. Baguslah. Why we need more foreign factories staff by even more foreigners here? All profits and salaries goes back to home countries in the end MY got nothing except foreigner problems. Best is local made brands, where everything stays in MY. In Asean, Volvo manufactured in My. Mazda and more. Try find where Merc assmbly plant in Asean are. While the full specifications of the Malaysia market X-Max have not been revealed, the European X-Max comes standard with ABS and traction control, along with keyless start. nice…price is right wt ABS for safety(raining here & road are wet)….will bring lots of customer whom prefer a daily transport that is practical for commuting to work. Malaysian tak peduli pasai safety, dia mau murah saja.. Speaking as a current scooter user (NMAX), I have been waiting for XMAX 250 ever since I first saw it online. Partly because of its design, but also because it offers more storage space (never liked having a big box behind me), bigger fuel tank, and a more powerful engine. All plus points when going for longer rides (in addition to the daily ride to/from work lah). However, whether I do upgrade or not will be completely dependent upon its pricing – If RM20k then probably keep my trusty NMAX. Damn, only 20 hp? But price close to 25k. Am I reading this right? Conventional auto box, not a CVT? Wow.